Escape from the Similar Rooms 18 - In yet another entry in the escape multiple-like-looking-rooms series, Hottategoya returns to the one puzzle per room format, leaving you stuck in each room until you can piece together the clues and solve your way through the door leading to the next room. Some animations make a pen and notepad come in very handy. Yet the logic used is solid, nothing too abstruse, while the aesthetics, albeit rather basic and white, are soothing and pleasing to the eye. And if you're enjoying this multiple-doors-to-get-open thing, you should also try 58 Works' DOOORS games, such as DOOORS 4. Find the Escape-Men 135: A Typical Escape Game 3 - from No1Game starts out in the quintessential escape game way: you wake up, lump on head, in a strange environment, unsure how you got there. There's no other story or reason to why you must do this but, if you're going to get anywhere, you need to collect ten escape-men. Since the object of the game focuses on finding, much of the gameplay is about the search: clicking on and examining every angle and object in each scene. Once clues are found, simple calculations result in needed solutions. No, it's not the most original or inspired entry in the Escape-Men series. Just typical. That doesn't mean it isn't good for whiling away a few minutes of break time. And for those of us who can't get enough hide-and-seek in our days, it's always good to have Little Things Forever nearby. 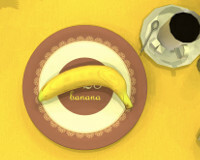 Fruit Kitchens No.16: Banana Yellow - The premise here is this: you're stuck in this funky yellow kitchen and, to unlock the door and exit, you must find and collect seven pieces of fruit. This is done quickly enough by searching every detail of the scene and solving a few simple puzzles. It has perhaps come to the point that FunkyLand and whimsical are synonymous. Perhaps to the point that they've gone bananas with whimsy-superfluity! And if you don't know what I mean, expose yourself to more such things as whimsy, kitsch, and funk by trying Little Gardens or This Way Up. Weekday Escape N°60 Walkthrough now available! The goal is to find seven bananas. Zoom in on the plate on the table. Take the banana from the plate. There's a clue but we'll come back to that. Zoom in on the kitchen wall. Take the banana from the left circular window. Zoom in on the left window. Open the window - it slides to the right. Take the banana from the window sill. Zoom in on the refrigerator on the right. Take the carton of banana yoghurt (?) from the upper shelf on its door. Zoom in on Funkyland's signature frog. Use the carton on the glass that the frog is holding. Take the key from the compartment. User the key on the cupboard to the left of the refrigerator. Take the long stick from the cupboard. Zoom in on the semi-circular skylight (theone with shades). Use the stick to take the banana from its lower edge. Zoom in on the plates on the shelf above the windows. Green 7, Yellow 2, Red 4. Zoom in on the plate. A red plate with +25. Zoom in on the cupboards with banana-shaped openings in the doors. Zoom in on the code buttons. Combine the clues found above. Click OK. The cupboard unlocks. Take the banana from the left hand compartment. Take the little banana palm from the right hand compartment. Zoom in on the box on the counter. Place the banana palm on the right. Clicking the buttons lowers the palms. Recreate the pattern from the glass. 0 times, 2 times, 1 time, 3 times. Take the banana from it. Zoom in on the right leg of the table. Take the can opener lying next to it. Zoom in on the counter. Use the can opener on the banana tin. When you have found all seven bananas, they will magically be tranformed into a key. The black spots on the paper clue are the same amount as what's needed for the door. Now what could those black spots represent to link the numbers together? The "+25" on the red plate. the receipt has something to do with the other code, but I can't figure it out. I've tried every combo I can think of. I currently have 4 EM, all but 1 of which came from non-code-access locations. @Leopardmask I'm stuck with 9... Why is there two digits for each item for the code you are stuck on? ...It doesn't have to do with counting the beer cans and stuff strewn about. If you click on any "point-and-click" or "escape" tag, 17-odd pages of games come up, going back about a decade. I have spent more hours than I care to confess trawling through the archives! Thanks for this week's round-up, as well as 3 from the archives! Awesome, Lynne! I love the archives...not just for the games, but also for cruising the comments and reviewing the history of JIG. Ah, good memories there! 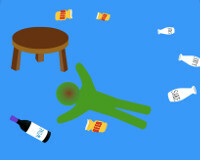 click on the uncrushed beer can? Do I have to be in a certain scene? Do I have to have the beer can showing enlarged along with the CLOSE button? HELP. I have nine EM and just need this one to finish.